Yes, these are the real tickets. 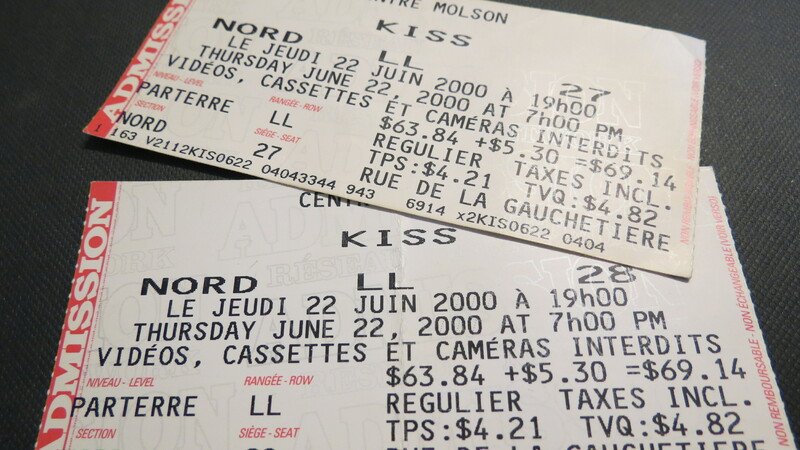 The Molson Centre in Montreal on June 27th, 2000, was chilly, loud and dark. After spending nearly an hour in the hot sun on Rene Levesque Boulevard, it was hard to see inside the cavernous auditorium. I kept my boyfriend’s long, blond hair in sight, occasionally grabbing a wrist or hem of his t-shirt so I wouldn’t lose him in the crowd. It wasn’t my first time at a live music concert but it was the first time I’d been to a metal concert. To say that I felt a little out of place is putting it mildly. My capri pants looked grandmotherly next to other girls miniskirts (or were those bandannas camouflaged as skirts?) and my t-shirt felt utterly un-rockstarish. We found our seats, along with thousands of new friends. Just as the first waft of smoke hit my nostrils, the cover band bound onto the stage. I couldn’t hear anything below screaming decibel so mostly I pantomimed different ideas to my boyfriend. Do you know where the bathroom is? When is KISS going to start playing? Did you bring anything to drink? Finally, all the lights dropped off except for the exit signs. Other types of smoke wafted through the air and I begged a cigarette off a guy two rows up, ripping the filter out to stick in my ear. I held the other one closed with a finger and wondered if I was going to make it another hour+ like this. Then lights exploded over the stage, pyrotechnics boomed and danced over the space and KISS rocked and rolled its way into my world. I couldn’t believe how much fun I had. I rocked. I rolled. I jumped up and down waving my fist in the air during a song that I hadn’t even realized was played by the infamous four. I made eye contact with Ace and Paul Stanley. I was still a little weirded out by Gene Simmons’ tongue but was mesmerized by his ability to play a guitar. I caught a guitar pick and squealed like a three month-old who’s just discovered her toes. Mostly, I was fascinated by the way that the Paul Stanley, the spokesman for the group, reiterated how much they loved us, their fans (and yes, by this time I did consider myself part of that group). Over and over throughout the night we were sent love from the stage, appreciation from the musicians who, quite honestly, have more money than many small countries and could have retired from touring years ago. When we left the concert later that night, my boyfriend asked me what I thought. “I loved it!” I gushed. I yammered away about the awesome pyrotechnics, the lights, the costumes–as though he hadn’t just experienced all of this for himself. “You know why I think that KISS has had such a successful, long-time career?” I asked. And that, I think, is how it should be for authors. Whether we’re newly self-published or traditional-house superstars, we owe it to our readers to thank them, over and over and in as many creative ways possible, for reading our books. When a business goes above and beyond what’s expected, we call it exceptional customer service. I think we need a new term for authors who do this: Exceptionothors. Exceptionauthors. Excepauthors? Well, OK. Forget the term. Let’s just focus on loving our fans and appreciating them any way we can. J.P. Choquette is working on a third suspense novel and loving her fans online and off in northwestern Vermont. Sign up for her free enewsletter and you might find yourself featured in one of her upcoming short suspense stories! This entry was posted in J.P. Choquette, Marketing, Of Interest, Opinion, Uncategorized, Writers. Bookmark the permalink.